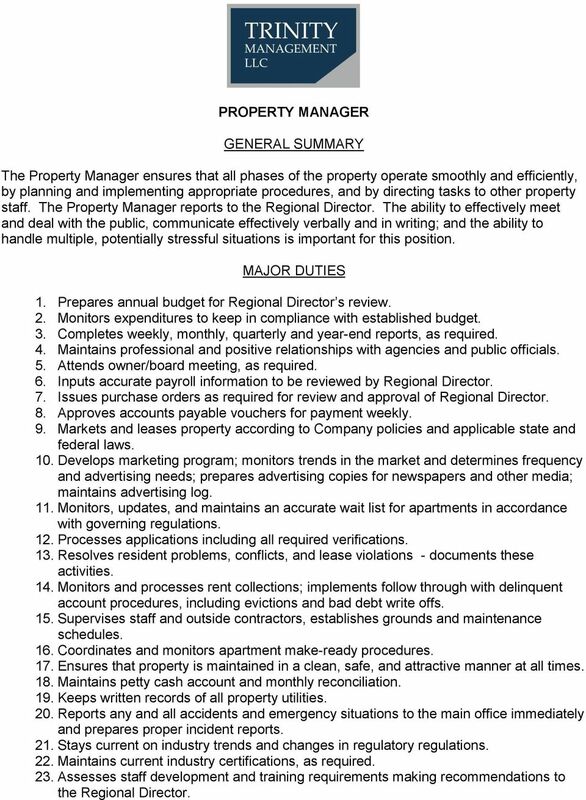 Download "PROPERTY MANAGER GENERAL SUMMARY"
1 PROPERTY MANAGER GENERAL SUMMARY The Property Manager ensures that all phases of the property operate smoothly and efficiently, by planning and implementing appropriate procedures, and by directing tasks to other property staff. The Property Manager reports to the Regional Director. The ability to effectively meet and deal with the public, communicate effectively verbally and in writing; and the ability to handle multiple, potentially stressful situations is important for this position. MAJOR DUTIES 1. Prepares annual budget for Regional Director s review. 2. Monitors expenditures to keep in compliance with established budget. 3. Completes weekly, monthly, quarterly and year-end reports, as required. 4. Maintains professional and positive relationships with agencies and public officials. 5. Attends owner/board meeting, as required. 6. Inputs accurate payroll information to be reviewed by Regional Director. 7. Issues purchase orders as required for review and approval of Regional Director. 8. Approves accounts payable vouchers for payment weekly. 9. Markets and leases property according to Company policies and applicable state and federal laws. 10. Develops marketing program; monitors trends in the market and determines frequency and advertising needs; prepares advertising copies for newspapers and other media; maintains advertising log. 11. Monitors, updates, and maintains an accurate wait list for apartments in accordance with governing regulations. 12. Processes applications including all required verifications. 13. Resolves resident problems, conflicts, and lease violations - documents these activities. 14. Monitors and processes rent collections; implements follow through with delinquent account procedures, including evictions and bad debt write offs. 15. Supervises staff and outside contractors, establishes grounds and maintenance schedules. 16. Coordinates and monitors apartment make-ready procedures. 17. Ensures that property is maintained in a clean, safe, and attractive manner at all times. 18. Maintains petty cash account and monthly reconciliation. 19. Keeps written records of all property utilities. 20. Reports any and all accidents and emergency situations to the main office immediately and prepares proper incident reports. 21. Stays current on industry trends and changes in regulatory regulations. 22. Maintains current industry certifications, as required. 23. Assesses staff development and training requirements making recommendations to the Regional Director. 2 24. Conducts periodic and consistent inspections of the property. 25. Assists Regional Director with capital planning for the property. 26. Monitors staff compliance with Fair Housing, OSHA, MSDS, employee safety policy, and other applicable codes and regulations. 27. May be required to work nights and weekends. 28. May be required to perform such other duties as assigned or inferred relative to the effective operation of the building as assigned by Regional Director or other senior staff. This is a general job description for this position. There will be times when the job responsibilities may be modified, or the Regional Director will have more involvement in the daily management of one or more properties. SUPERVISION EXERCISED Supervises all property staff. The number of staff members supervised is dependent upon the size and location of property. Directly accountable to Regional Director. SUPERVISION RECEIVED TOOLS AND EQUIPMENT USED Multi-line telephone system, computer, Internet, word and math processing systems, scanner, various software programs, copy machine, postage machine, fax machine, calculator, pager. PHYSICAL DEMANDS The physical demands described here are representative of those that must be met by an employee to successfully perform the essential functions of the job. Reasonable Accommodations may be made to enable individuals with disabilities to perform the essential functions. While performing the duties of this job, the employee is frequently required to walk, sit and talk or hear. The employee is required to use hands to finger, handle, or feel objects, tools, or controls, and reach with hands or arms. The employee is occasionally required to sit; climb or balance; stoop, kneel, couch or crawl. The employee must occasionally lift and/or move up to 25 pounds. Specific vision abilities required by this job include close peripheral vision, depth perception and the ability to adjust focus. WORK ENVIRONMENT The work environment characteristics described her are representative of those an employee encounters while performing the essential functions of this job. The noise level in the work environment is usually quiet to moderately noisy in the building and can be moderately noisy when outside. 3 SELECTION GUIDELINES Formal application rating of experience and education, oral interview, reference checks, and job related tests may be required. The duties listed above are intended only as illustrations of the various types of work that may be performed. The omission of specific statements of duties does not exclude them from the position if the work is similar, related or a logical assigned to the position. The job description does not constitute an employment agreement between the employer and employee and is subject to change by the employer as the needs of the employer and requirements of the job change. 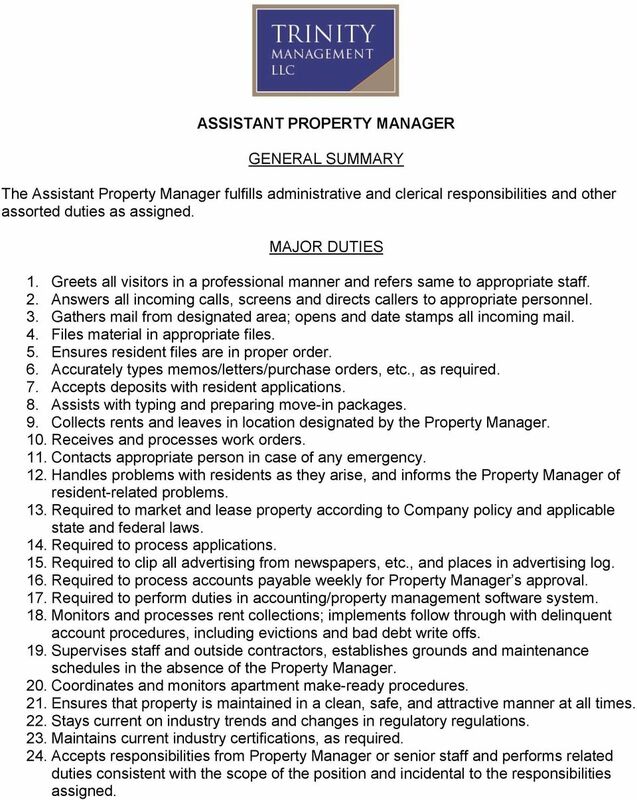 4 ASSISTANT PROPERTY MANAGER GENERAL SUMMARY The Assistant Property Manager fulfills administrative and clerical responsibilities and other assorted duties as assigned. MAJOR DUTIES 1. Greets all visitors in a professional manner and refers same to appropriate staff. 2. Answers all incoming calls, screens and directs callers to appropriate personnel. 3. Gathers mail from designated area; opens and date stamps all incoming mail. 4. Files material in appropriate files. 5. Ensures resident files are in proper order. 6. Accurately types memos/letters/purchase orders, etc., as required. 7. Accepts deposits with resident applications. 8. Assists with typing and preparing move-in packages. 9. Collects rents and leaves in location designated by the Property Manager. 10. Receives and processes work orders. 11. Contacts appropriate person in case of any emergency. 12. Handles problems with residents as they arise, and informs the Property Manager of resident-related problems. 13. Required to market and lease property according to Company policy and applicable state and federal laws. 14. Required to process applications. 15. Required to clip all advertising from newspapers, etc., and places in advertising log. 16. Required to process accounts payable weekly for Property Manager s approval. 17. Required to perform duties in accounting/property management software system. 18. Monitors and processes rent collections; implements follow through with delinquent account procedures, including evictions and bad debt write offs. 19. Supervises staff and outside contractors, establishes grounds and maintenance schedules in the absence of the Property Manager. 20. Coordinates and monitors apartment make-ready procedures. 21. Ensures that property is maintained in a clean, safe, and attractive manner at all times. 22. Stays current on industry trends and changes in regulatory regulations. 23. Maintains current industry certifications, as required. 24. Accepts responsibilities from Property Manager or senior staff and performs related duties consistent with the scope of the position and incidental to the responsibilities assigned. 5 SUPERVISION EXERCISED In absence of the Property Manager, supervises all property staff. SUPERVISION RECEIVED This position is under the immediate direction of the Property Manager. TOOLS AND EQUIPMENT USED Multi-line telephone system, l computer, Internet, word and math processing programs, various software programs, copy machine, postage machine, fax machine, calculator, and scanner. 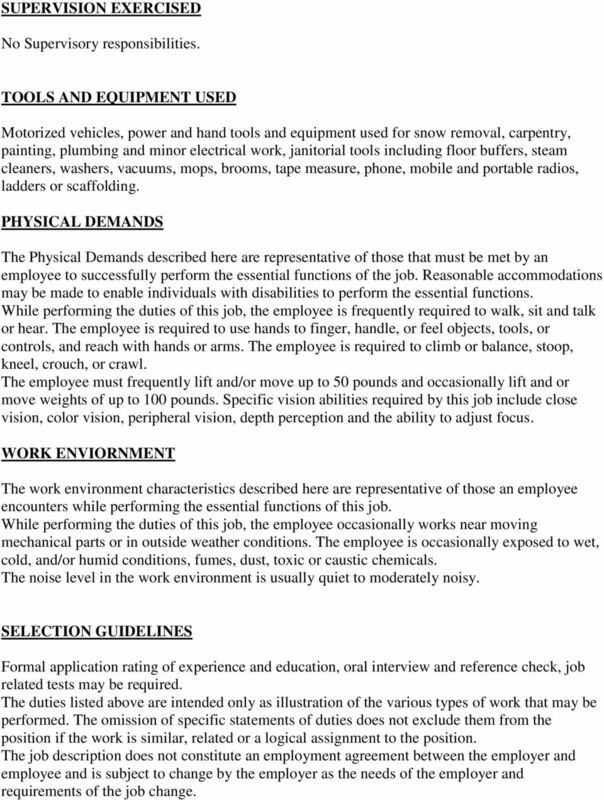 PHYSICAL DEMANDS The physical demands described here are representative of those that must be met by an employee to successfully perform the essential functions of the job. Reasonable Accommodations may be made to enable individuals with disabilities to perform the essential functions. While performing the duties of this job, the employee is frequently required to walk, sit and talk or hear. The employee if required to use hands to finger, handle, or feel objects, tools or controls, talk or hear and reach with hands or arms. 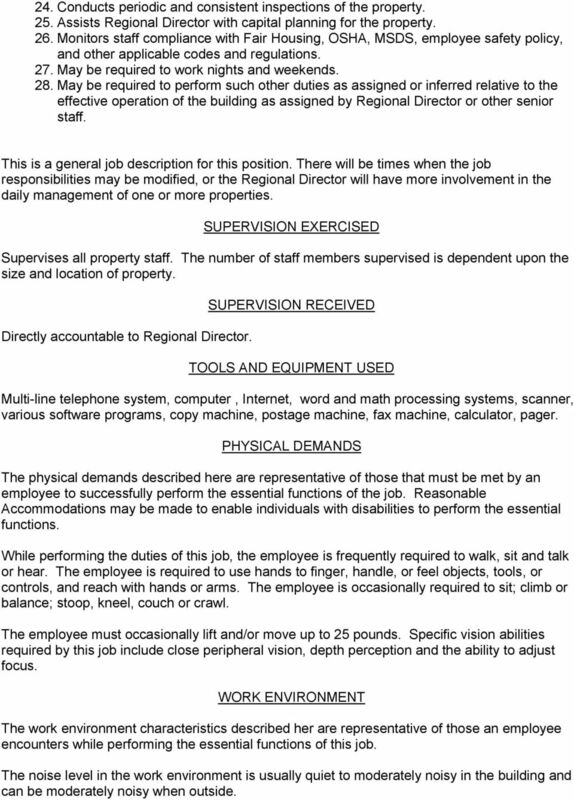 The employee must occasionally lift and/or move up to 25 pounds. Specific vision abilities required by the job include close vision and the ability to adjust focus. WORK ENVIRONMENT The work environment characteristics described here are representative of those an employee encounters while performing the essential functions of this job. The noise level in the work environment is usually moderate to loud. SELECTION GUIDELINES Formal application rating of experience and education, oral interview and reference check, job related tests may be required. The duties listed above are intended only as illustrations of the various types of work that may be performed. The omission of specific statements of duties does not exclude them from the position if the work is similar, related or a logical assignment to the position. The job description does not constitute an employment agreement between the employer and employee and is subject to change by the employer as the needs of the employer and requirements of the job change. 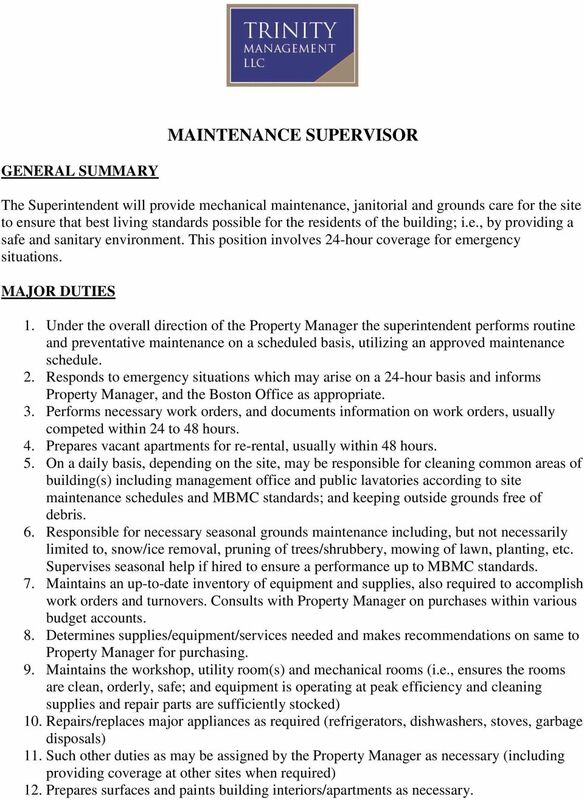 6 MAINTENANCE SUPERVISOR GENERAL SUMMARY The Superintendent will provide mechanical maintenance, janitorial and grounds care for the site to ensure that best living standards possible for the residents of the building; i.e., by providing a safe and sanitary environment. This position involves 24-hour coverage for emergency situations. MAJOR DUTIES 1. Under the overall direction of the Property Manager the superintendent performs routine and preventative maintenance on a scheduled basis, utilizing an approved maintenance schedule. 2. Responds to emergency situations which may arise on a 24-hour basis and informs Property Manager, and the Boston Office as appropriate. 3. Performs necessary work orders, and documents information on work orders, usually competed within 24 to 48 hours. 4. Prepares vacant apartments for re-rental, usually within 48 hours. 5. On a daily basis, depending on the site, may be responsible for cleaning common areas of building(s) including management office and public lavatories according to site maintenance schedules and MBMC standards; and keeping outside grounds free of debris. 6. Responsible for necessary seasonal grounds maintenance including, but not necessarily limited to, snow/ice removal, pruning of trees/shrubbery, mowing of lawn, planting, etc. Supervises seasonal help if hired to ensure a performance up to MBMC standards. 7. Maintains an up-to-date inventory of equipment and supplies, also required to accomplish work orders and turnovers. Consults with Property Manager on purchases within various budget accounts. 8. Determines supplies/equipment/services needed and makes recommendations on same to Property Manager for purchasing. 9. Maintains the workshop, utility room(s) and mechanical rooms (i.e., ensures the rooms are clean, orderly, safe; and equipment is operating at peak efficiency and cleaning supplies and repair parts are sufficiently stocked) 10. Repairs/replaces major appliances as required (refrigerators, dishwashers, stoves, garbage disposals) 11. Such other duties as may be assigned by the Property Manager as necessary (including providing coverage at other sites when required) 12. Prepares surfaces and paints building interiors/apartments as necessary. 7 SUPERVISION RECEIVED Works under the general supervision of the Property Manager who outlines general policy. Performs regular duties both under the direction of the Property Manager and independently using own technical knowledge and judgment. Alerts Supervisor to serious problems of noncompliance and policy issues or staff issues. Work is reviewed through regular meetings, records, public feedback, and Regional Directors feedback. Directly responsible to Property Manager; occasionally accountable to other senior staff including limited accountability to onsite Rental Administrator. SUPERVISION EXERCISED Responsible for the supervision and control of building maintenance staff, custodial staff, ground workers, and vendors or contractors involved with the site. Responsible for overseeing work done by outside contractors and supervising part-time/seasonal employees if applicable. SPECIAL REQUIREMENTS Valid Driver s license. TOOLS AND EQUIPMENT USED Motorized vehicles, power and hand tools and equipment for snow removal, carpentry, painting, plumbing, and minor electrical work; janitorial tools including floor buffers, steam cleaners, washers, vacuums, mops, brooms, calculator, copy and fax machine; phone, mobile or portable radio. 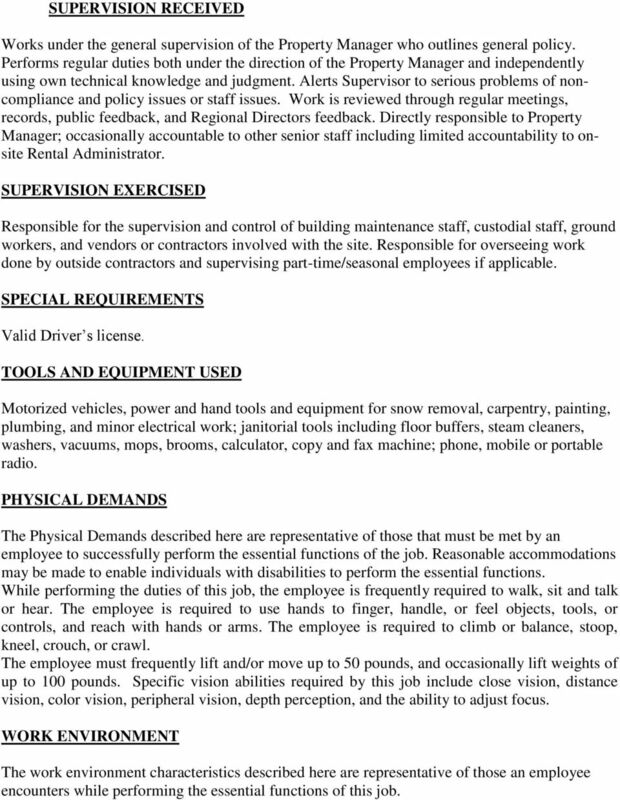 PHYSICAL DEMANDS The Physical Demands described here are representative of those that must be met by an employee to successfully perform the essential functions of the job. Reasonable accommodations may be made to enable individuals with disabilities to perform the essential functions. While performing the duties of this job, the employee is frequently required to walk, sit and talk or hear. The employee is required to use hands to finger, handle, or feel objects, tools, or controls, and reach with hands or arms. The employee is required to climb or balance, stoop, kneel, crouch, or crawl. The employee must frequently lift and/or move up to 50 pounds, and occasionally lift weights of up to 100 pounds. Specific vision abilities required by this job include close vision, distance vision, color vision, peripheral vision, depth perception, and the ability to adjust focus. WORK ENVIRONMENT The work environment characteristics described here are representative of those an employee encounters while performing the essential functions of this job. 8 While performing the duties of this job, the employee occasionally works near moving mechanical parts or in outside weather conditions. The employee is occasionally exposed to wet, cold, and/or humid conditions, fumes, dust, toxic or caustic chemicals. The noise level in the work environment is usually quiet to moderately noisy. SELECTION GUIDELINES Formal application rating of experience and education, oral interview and reference check, job related tests may be required. The duties listed above are intended only as illustration of the various types of work that may be performed. The omission of specific statements of duties does not exclude them from the position if the work is similar, related or a logical assignment to the position. The job description does not constitute an employment agreement between the employer and employee and is subject to change by the employer as the needs of the employer and requirements of the job change. 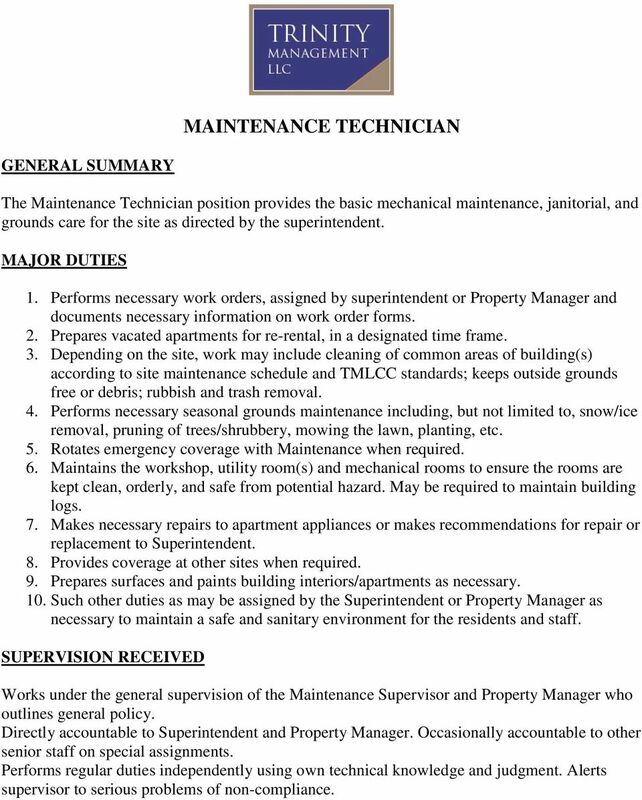 9 MAINTENANCE TECHNICIAN GENERAL SUMMARY The Maintenance Technician position provides the basic mechanical maintenance, janitorial, and grounds care for the site as directed by the superintendent. MAJOR DUTIES 1. Performs necessary work orders, assigned by superintendent or Property Manager and documents necessary information on work order forms. 2. Prepares vacated apartments for re-rental, in a designated time frame. 3. Depending on the site, work may include cleaning of common areas of building(s) according to site maintenance schedule and TMLCC standards; keeps outside grounds free or debris; rubbish and trash removal. 4. Performs necessary seasonal grounds maintenance including, but not limited to, snow/ice removal, pruning of trees/shrubbery, mowing the lawn, planting, etc. 5. Rotates emergency coverage with Maintenance when required. 6. Maintains the workshop, utility room(s) and mechanical rooms to ensure the rooms are kept clean, orderly, and safe from potential hazard. May be required to maintain building logs. 7. Makes necessary repairs to apartment appliances or makes recommendations for repair or replacement to Superintendent. 8. Provides coverage at other sites when required. 9. Prepares surfaces and paints building interiors/apartments as necessary. 10. Such other duties as may be assigned by the Superintendent or Property Manager as necessary to maintain a safe and sanitary environment for the residents and staff. SUPERVISION RECEIVED Works under the general supervision of the Maintenance Supervisor and Property Manager who outlines general policy. Directly accountable to Superintendent and Property Manager. Occasionally accountable to other senior staff on special assignments. Performs regular duties independently using own technical knowledge and judgment. Alerts supervisor to serious problems of non-compliance. 10 SUPERVISION EXERCISED No Supervisory responsibilities. TOOLS AND EQUIPMENT USED Motorized vehicles, power and hand tools and equipment used for snow removal, carpentry, painting, plumbing and minor electrical work, janitorial tools including floor buffers, steam cleaners, washers, vacuums, mops, brooms, tape measure, phone, mobile and portable radios, ladders or scaffolding. PHYSICAL DEMANDS The Physical Demands described here are representative of those that must be met by an employee to successfully perform the essential functions of the job. Reasonable accommodations may be made to enable individuals with disabilities to perform the essential functions. While performing the duties of this job, the employee is frequently required to walk, sit and talk or hear. The employee is required to use hands to finger, handle, or feel objects, tools, or controls, and reach with hands or arms. The employee is required to climb or balance, stoop, kneel, crouch, or crawl. The employee must frequently lift and/or move up to 50 pounds and occasionally lift and or move weights of up to 100 pounds. Specific vision abilities required by this job include close vision, color vision, peripheral vision, depth perception and the ability to adjust focus. WORK ENVIORNMENT The work environment characteristics described here are representative of those an employee encounters while performing the essential functions of this job. While performing the duties of this job, the employee occasionally works near moving mechanical parts or in outside weather conditions. The employee is occasionally exposed to wet, cold, and/or humid conditions, fumes, dust, toxic or caustic chemicals. The noise level in the work environment is usually quiet to moderately noisy. SELECTION GUIDELINES Formal application rating of experience and education, oral interview and reference check, job related tests may be required. The duties listed above are intended only as illustration of the various types of work that may be performed. The omission of specific statements of duties does not exclude them from the position if the work is similar, related or a logical assignment to the position. The job description does not constitute an employment agreement between the employer and employee and is subject to change by the employer as the needs of the employer and requirements of the job change. 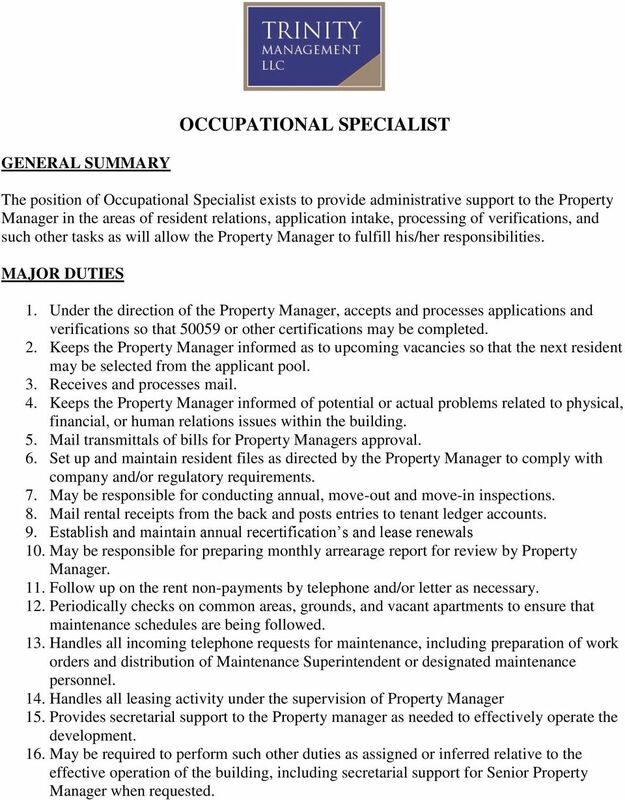 11 OCCUPATIONAL SPECIALIST GENERAL SUMMARY The position of Occupational Specialist exists to provide administrative support to the Property Manager in the areas of resident relations, application intake, processing of verifications, and such other tasks as will allow the Property Manager to fulfill his/her responsibilities. MAJOR DUTIES 1. Under the direction of the Property Manager, accepts and processes applications and verifications so that or other certifications may be completed. 2. Keeps the Property Manager informed as to upcoming vacancies so that the next resident may be selected from the applicant pool. 3. Receives and processes mail. 4. Keeps the Property Manager informed of potential or actual problems related to physical, financial, or human relations issues within the building. 5. Mail transmittals of bills for Property Managers approval. 6. Set up and maintain resident files as directed by the Property Manager to comply with company and/or regulatory requirements. 7. May be responsible for conducting annual, move-out and move-in inspections. 8. Mail rental receipts from the back and posts entries to tenant ledger accounts. 9. Establish and maintain annual recertification s and lease renewals 10. May be responsible for preparing monthly arrearage report for review by Property Manager. 11. Follow up on the rent non-payments by telephone and/or letter as necessary. 12. Periodically checks on common areas, grounds, and vacant apartments to ensure that maintenance schedules are being followed. 13. Handles all incoming telephone requests for maintenance, including preparation of work orders and distribution of Maintenance Superintendent or designated maintenance personnel. 14. Handles all leasing activity under the supervision of Property Manager 15. Provides secretarial support to the Property manager as needed to effectively operate the development. 16. May be required to perform such other duties as assigned or inferred relative to the effective operation of the building, including secretarial support for Senior Property Manager when requested. 12 SUPERVISION EXERCISED Discretion is limited to minor matters generally involving financial sums less than $100; routine inquires for resident s vis-à-vis building operations; suggestions or recommendations to Property Manager in areas such as budget development and/or office operation. May be asked to oversee office support help where applicable. SUPERVISION RECEIVED Directly responsible to Property Manager; occasionally accountable to Property Manager and other senior staff when involved in special projects. 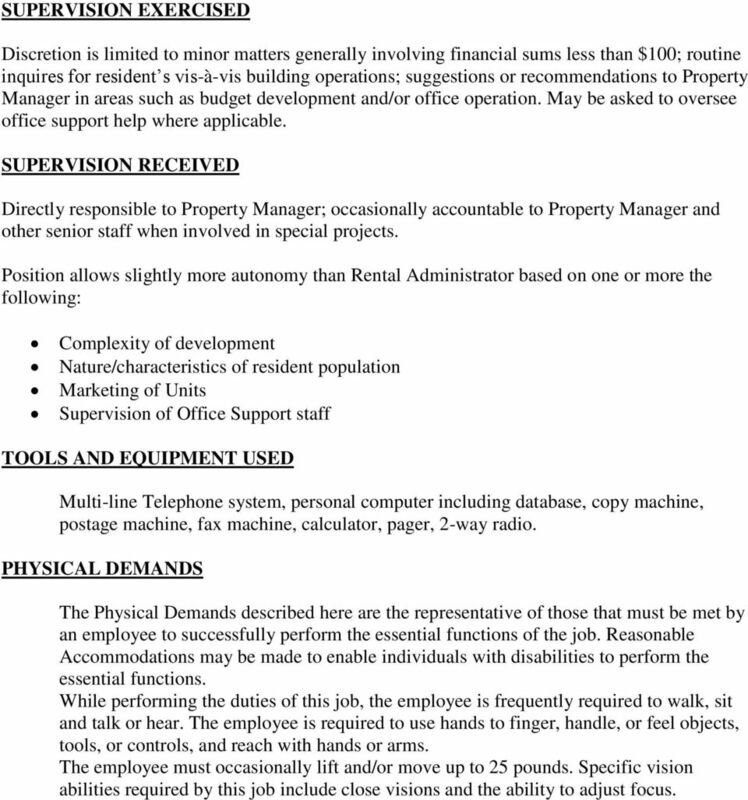 Position allows slightly more autonomy than Rental Administrator based on one or more the following: Complexity of development Nature/characteristics of resident population Marketing of Units Supervision of Office Support staff TOOLS AND EQUIPMENT USED Multi-line Telephone system, personal computer including database, copy machine, postage machine, fax machine, calculator, pager, 2-way radio. PHYSICAL DEMANDS The Physical Demands described here are the representative of those that must be met by an employee to successfully perform the essential functions of the job. Reasonable Accommodations may be made to enable individuals with disabilities to perform the essential functions. While performing the duties of this job, the employee is frequently required to walk, sit and talk or hear. The employee is required to use hands to finger, handle, or feel objects, tools, or controls, and reach with hands or arms. The employee must occasionally lift and/or move up to 25 pounds. 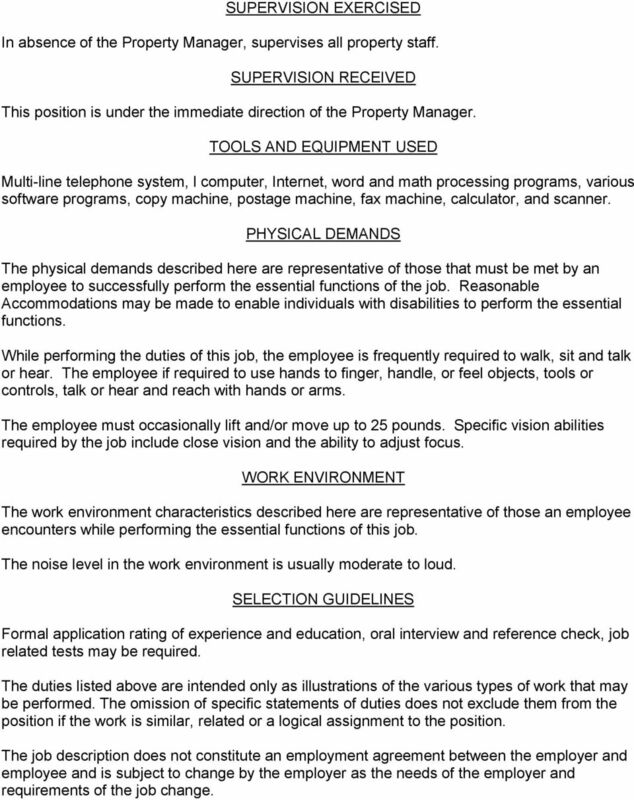 Specific vision abilities required by this job include close visions and the ability to adjust focus. 13 WORK ENVIRONMENT The work environment characteristics described here are representative of those an employee encounters while performing the essential functions of this job. The noise level in the work environment is usually moderate to loud. SELECTION GUIDELINES Formal Application rating of experience and education, oral interview and reference check, job related tests may be required. The Duties listed above are intended only as illustration of the various types of work that may be performed. The omission of specific statements of duties does not exclude them from the position if the work is similar, related or a logical assignment to position.